FLOSS Manuals is a non-profit online community whose aim is to produce quality free documentation for free software. The community started as an English only project but rapidly evolved to other languages. 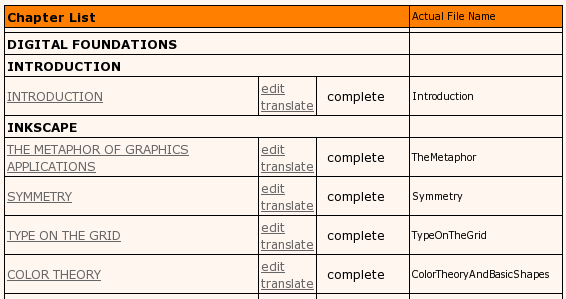 There are currently 5 language implementations of FLOSS Manuals; English, French, Dutch, Finnish and Farsi. Of these the English site is by far the most active, and second to this would be Farsi and Finnish. As of June 2009, FLOSS Manuals has approximately 1000 registered contributors with 750 of these registered only on the English site. To enable Localization and Translation FLOSS Manuals has built its own tool set on top of the core platform (Twiki). These extensions are available from the TWiki.org repository and they enable some very useful functionality. The two plugins are called Xchange and Localize. 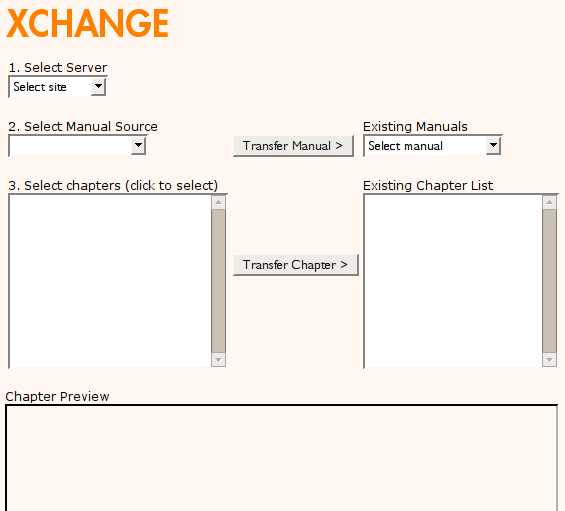 Xchange enables the transfer of manuals and chapters between each language implementation. The basic mechanism is RSS which also opens some interesting opportunities for an RSS manual publishing mechanism which has not yet been explored. Localize is a Portable Object file editor (.po file). PO files are used to translate the interface of FLOSS Manuals. When a new language community wants FLOSS Manuals the interface is translated using Localize. FLOSS Manuals prefers to work towards establishing autonomous language communities. This is because manuals need to be kept alive and grow. If a manual is simply translated without a community to maintain it then the life span of the manual is limited. Therefore, it is preferable to establish language communities that create original material as well as translate and maintain material. The theory is that once there has been significant activity in any one language in the Translation Zone, then the content and community to can establish a FLOSS Manuals language site. When a manual is transferred between language servers it is placed in a translation work flow. This means that the manuals are editable as if they had been created with the standard FLOSS Manuals manual creation process, but there is also an additional 'translate' button. This button enables access to the translation view of any chapter - which is a page where the chapter can be edited. The edit window displays alongside the original source material. Translators can then see the original source and browse forward to any newer revisions of the material to check the translation against the latest version of the chapter. When a translator has finished working on a chapter they can mark it with any one of a number of status markings including 'to be proofed', 'needs images', 'untranslated', 'needs updating' etc. In theory each manual has a Maintainer and it is their job to check the quality of the content before pushing the 'publish' button. The publish process copies all dynamic content to static HTML files, and generates a PDF. These published files are what the 'reader' sees and the theory is that no content will be brought forward into reader space unless the manuals are of very good quality. However, the reality is that not every manual has a dedicated or pro-active Maintainer so this process is not well regulated in some of the sites. We have found however, that as the size of the community grows this process improves. While this work flow is not sophisticated it at least works technically and is reasonably easy to use. Additionally, each language community has a community manager and it is their job to recruit and build an ecosystem of contributors. This means working out who is translating, what the quality of the translations are, and how to build an environment to improve the translations. The theory is that each language community will manage its own quality control. In the English site the quality is managed by the contributors checking each others work and each manual has a Maintainer whose job it is to keep an eye on quality issues and develop strategies as necessary. For the creation of original material on the English site this works very well however, as mentioned above, there is not yet enough participation on the other language sites to gauge the effectiveness of this strategy for translation although we have had comments that some manuals have been very well translated and very few comments to the contrary. The largest technical issue we have faced apart from developing the Localize and Translate plugins, has been to work through the issues for supporting bi-directional text. This issue arose during the development of the FLOSS Manuals Farsi site, and since the technical developers were not familiar with right-to-left layout, nor how it works with left-to-right text when displayed on the same page. As the technicians were working remotely with the Farsi management team this process was very confusing at first and required a lot of patience, communication and testing. Thankfully FLOSS Manuals has resolved these issues and can now support authoring in a bi-directional environment, and the rendering of this content in HTML and book formatted PDF. Unicode support for our PDF engine has now also been resolved. FLOSS Manuals is developing a new platform for collaborative authoring and will investigate the integration of other Free Software tools into the translation tool chain, including Pootle and World Wide Lexicon. Work flow elements will be developed however, the issue of translator management and quality control will still largely remain in the domain of community and volunteer management.